This historic marker home has been owned by only two families since it was built in the late l860s. The Baethge family built a three-room structure and attic. Your hosts have displayed the clay bricks and log beams used in the original construction. The old "Rumpelkammer" (junkroom) is now a modern bathroom with a Jacuzzi. Before 1901 the rock portion of the home was added and is presently the open kitchen, dining, and living room. The Behrend family bought the house in 1937. They renovated the house to be used as a guest house, and the Behrend clan enjoys showing off the history so evident in the house, the outbuildings, and the heirlooms they have displayed. Entering the foyer, family heirlooms are apparent. An antique sewing machine is displayed, a family quilt is hung, and the roll-top desk displays the guest book. One of the bedrooms has a king-sized bed created with wood from the old corral on the property. Adjoining the bedroom is a modern bath with a Jacuzzi tub and shower. The second bedroom with a queen-sized bed displays a quilt bedspread and fluffy pillows. A box of dried flowers and a family quilt are hung to highlight the white walls and wood floors. An adjacent bath has a claw foot tub. The kitchen, dining, and living room are an open concept with an area dedicated to the kitchen (equipped for light cooking), the dining room area with a wood table for four and a family china cabinet, and the living room with a rock fireplace. A sofa and chair are accented by blue braid rugs highlighting the wood floors. The front porch swing is perfect for enjoying the country views. 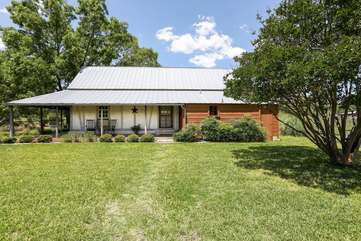 This home is located only 3.1 miles from Fredericksburg. For our first visit to the Hill Country, we were seeking a place that would give us the experience of living in the area as it was when first occupied by the settlers. We found the house to be a wonderful example of the architecture of the time and the examples of the family's history throughout the house just added to the experience. Each afternoon, we looked forward to sitting on the porch, enjoying a glass of wine and watching as the sun slowly set. It was a bonus to see the flock of wild turkeys that visited at least once a day and the deer who came to graze at dusk and dawn. Our most memorable sighting was of a brown spotted buck early one morning. He was just stunning! The house was comfortable and included most anything one would need for a few days visit. What an awesome opportunity to experience true Texas history. The house has been owned by two families for the past 150 years, yet has all the modern conveniences and comforts of today. It's like staying in a very comfortable museum where almost every item has history to it. The owners original marriage certificates, 100 year old pictures of their children, old china and furniture (one of the beds is made from the old corral!). All of it meticulously documented for your edification. The rooms were clean and well appointed while still respecting the history. Could not recommend this place more. The German House was beautiful, full of history of the two families who owned it. It was very well keep and clean. More then enough room and very comfortable. Front porch was so nice for morning coffee, and evening wine. Deer in the yard morning and night. Hummingbirds off the porch, wild turkeys, and a wood pecker made it all a little bit country. Can't wait to go back. This was the cleanest place we ever stayed in and there were live Ivy plants in the rooms that were well kept. It is a great place and would highly recommend it.